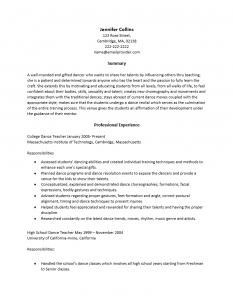 The Dance Teacher Resume Template gives a leg up in attaining a position in a very competitive industry. While being a dance teacher must possess a specific set of rare skills and there are much fewer dance schools than dance teachers. This means that educational facilities with an opening for teaching dance will be able to select who they consider the best fit…and there will be more than one applicant that fits the bill. 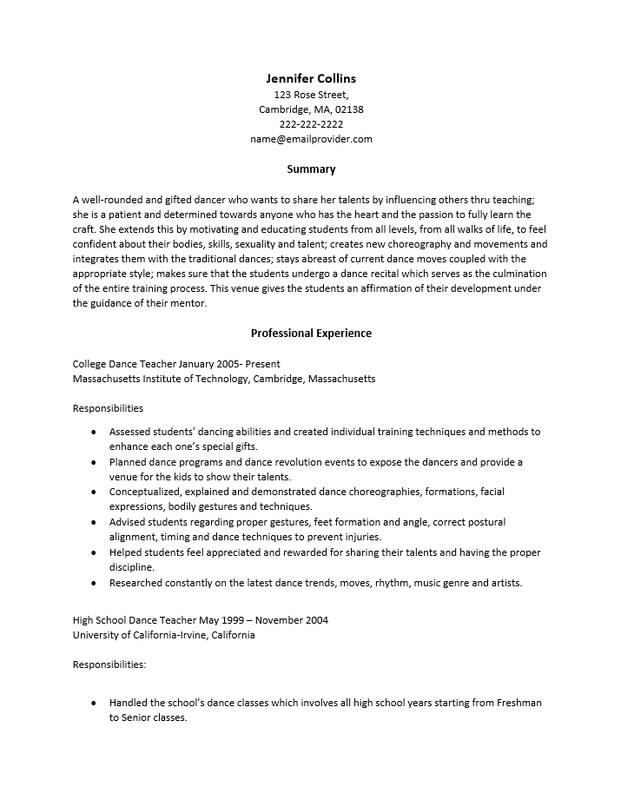 This leaves dance teachers seeking a position with the burden of attracting attention to themselves among a multitude of resumes as well as keeping both their dance and teaching skills sharp. Step 1. The first piece of a resume that every employer looks at is the name. The applicant name should always be located at the top of the page however there is some freedom here. An applicant may choose to align it to the left or even the right (so long as it remains professional looking). It’s customary to also enlarge the name, itself, as this will make it both easier to read and more memorable. Hint: Use the same font type throughout the document, and if enlarging your name make it 1-2 points larger than the headings in the resume. Step 2. The Summary section is a candidate’s opportunity to shine. In this section, a job seeker should give a very clear picture of who they are, what they are like as a dance teacher, and where their strengths are. This is likely one of the most important sections on the resume as it can convince a potential employer to give an inexperienced candidate a chance and/or serve to both support and be supported by the next sections. Step 3. The Professional Experience section is considered by many to be the basis of proof that a candidate can handle or excel in the available position. Each entry must begin with the job title held and the date range for employment. The next line will be the name of the employer and physical location. Finally will be a sub-heading called “Responsibilities” where a candidate may showcase their experience and accomplishments for that employer. It is standard for this information to be listed in reverse chronological order and that each entry is a separate employer. Step 4. The “Education” section is particularly important when job hunters seek a teaching position. Recruiters or hiring entities must know a candidate’s academic credentials in order for that applicant to be taken seriously. The “Education” should list when someone went to a school and the degree earned on the first line. The second line should be the name and location of the school and the final line may be any supporting information (i.e. GPA). This section will be followed by the “Skills and Certifications” section which will add to it. The “Skills and Certifications” section will be a list of any certificate programs successfully completed and may include any abilities the candidate has not previously reported. Step 5. The final section, “Associations” is optional. If the candidate has a current membership in any clubs or organizations relating to dance, they should be listed here.